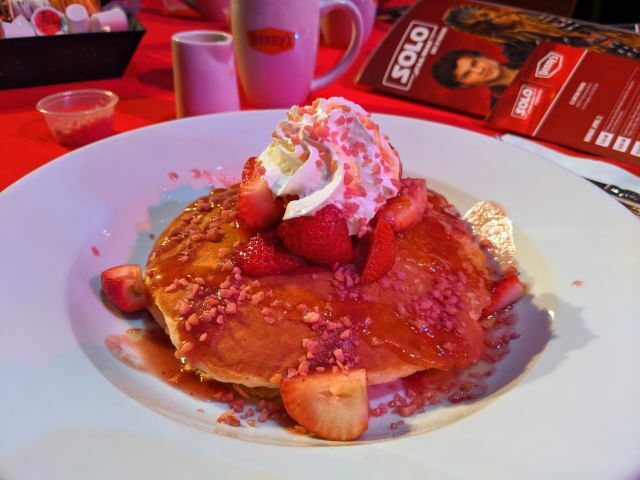 Denny's Co-Reactor Pancakes feature two buttermilk pancakes topped with fresh strawberries, strawberry sauce, and whipped cream plus a side of Crystal Crunch Rocks (popping candy) and a mini-pitcher of warm citrus sauce. An order of the pancakes costs $6.99 but I received these courtesy of Denny's. You're meant to sprinkle on the candy and then drizzle on the citrus sauce which causes the candy to start popping. I could hear it quite well in a normal seating position (i.e. I didn't have to put my ear to it). The Crystal Crunch Rocks tasted like strawberry popping candy but were generally larger and shaped like mini asteroids (to fit a Star Wars theme I think). Additionally, a thin, gummy shell surrounded each candy lending a smooth, rounded feel rather than a sharp cragginess. I think the shell is meant to slow down the popping reaction so that it'll last throughout the meal (and indeed there was plenty of popping throughout). 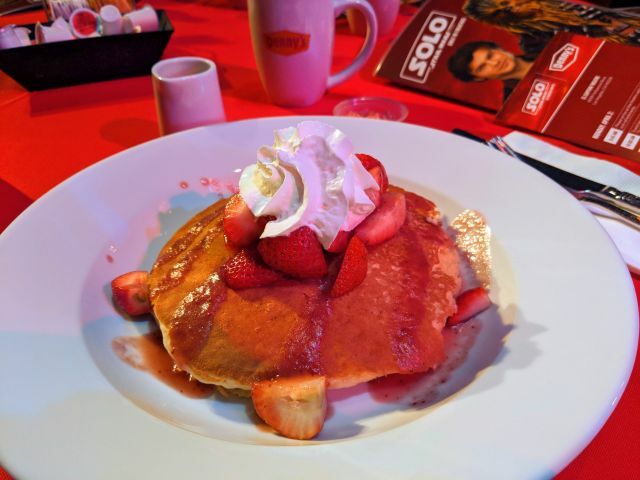 Beyond the popping candy, the pancakes were nice and fluffy. With the strawberries, strawberry sauce, and whipped cream, it made for a very familiar combination. I found myself dipping the somewhat unripe strawberries in the whipped cream occasionally. The citrus sauce seemed to be orange-based (there was visible orange zest in it) and felt like a warm, thickened, slightly watered-down orange juice. It went well with the strawberries. Overall, Denny's Co-Reactor Pancakes were pretty cool with the popping effect once the citrus sauce hits and were also enjoyable as a plate of pancakes with light and tangy fruit elements. The popping candy works well on the pancakes but are also quite nice if you want to shovel them in your mouth like when you were a kid (or maybe you never stopped...).